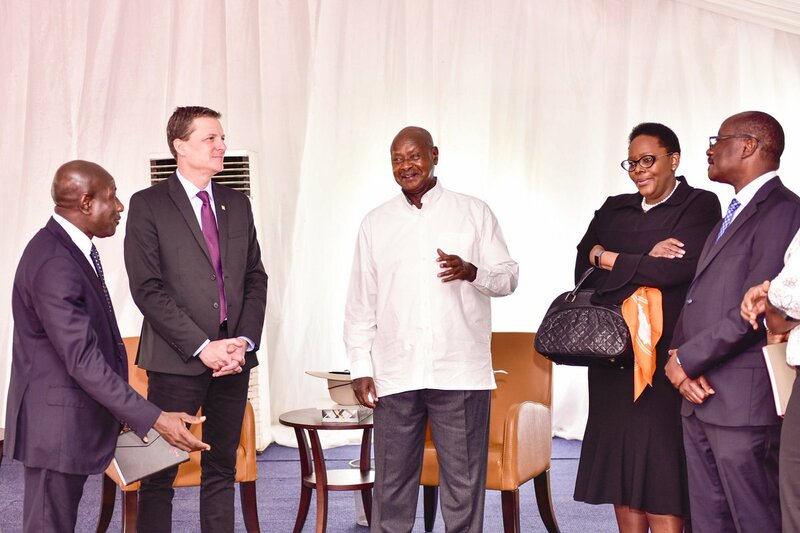 MUNYONYO – President Yoweri Museveni has met officials of MTN Group led by their Group Chief excutive officers Rob Shuter and their MTN Uganda Chairman Charles Mbire. Museveni met the officials of the embattled telecommunication giant on the sidelines of the Africa Now think tank summit in Munyonyo, Kampala. Mr Shuter arrived in Uganda on Monday, March 11 just a few days after the deportation of top executives in the leading telecommunications company, which has indicated continued tensions between the company and the government of Uganda. 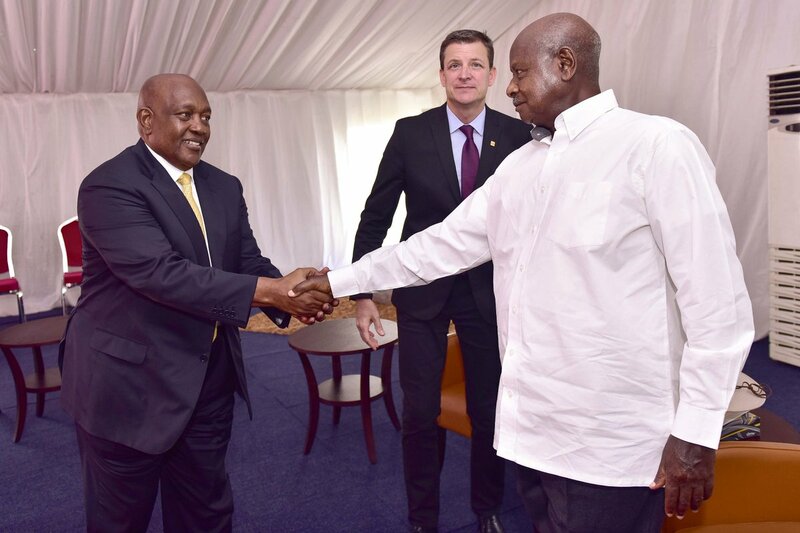 In January this year, Mr. Shuter, met Mr. Museveni on the sidelines of the World Economic Forum (WCF) in Davos, Switzerland, in what many thought was a bid to resolve the ongoing standoff between the South Africa telecom company and the Kampala regime over spying allegations. Mr. Shuter is said reaffirmed MTN Group’s commitment to Uganda and discuss recent developments in the market. Days before the Devos meeting Police in Kampala deported two MTN bosses, chief marketing officer Olivier Printout, a French national, and head of sales and distribution, Ms. Annie Tabura, a Rwandan, to France and Rwanda respectively, for allegedly engaging in activities that threaten national security. Ms. Elsa Mussolini, the MTN mobile money general manager, was also days later deported back to Italy after being grilled for about four hours at the Special Investigations Division (SID) in Kireka, near Kampala. The deportations threw the telecom giant under the spotlight and this was made worse by the most recent deportation of the CEO Wim Vanhellepute. 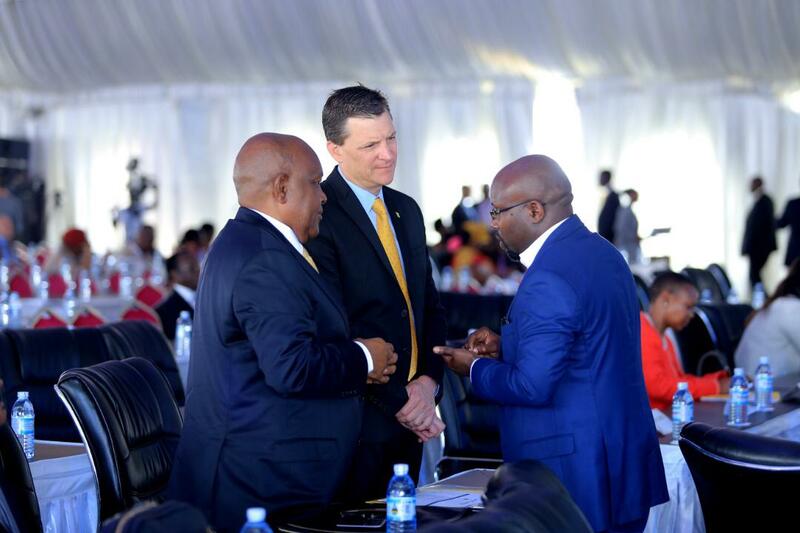 Mr. Shuter was among the guest speakers at the Africa Now Summit.. in his remarks, Mr Shuter leadership in all sectors is super important arguing Africans to look at the opportunities ahead. Shortly after President Museveni’s meeting with Shuter in Davos, State House Kampala announced that the month-long dispute over the company’s license renewal had been resolved and the company had also agreed to spread its ownership to more Ugandans through a share placement with the National Social Security Fund. In October 2018, President Museveni wrote to Uganda Communications Commission questioning why MTN’s license fees had been revised down to $58m (about Shs217b) from the original $100m (about Shs370 billion). He added that the government was aware that MTN Uganda was under-declaring its profits and repatriating them. In the letter, Mr Museveni questioned UCC why it revised the licence fees without involving the Ministry of Finance and Uganda Revenue Authority. This prompted the issuance of a second interim licence extension to MTN running for 60 days from November 20 until January 20. MTN Group is a multinational telecommunications group connecting approximately 232 million people in 22 countries across Africa and the Middle East. MTN dominates the Uganda mobile telephone market, boasting more than half of the country’s total subscribers, estimated at about 22 million.